Calathea lutea (Cuban Cigar), an exotic tropical stunner! Weren’t you surprised that these majestically tall plants, up to 3 meters in height, with green and unpatterned foliage bears the name, Calathea lutea? We definitely were as most calatheas not only have beautifully patterned and variegated leaves but are rather dwarfish (about 60 cm) in stature, unlike this rather tall species. Nevertheless, whatever it lacked is made up by its other unusual characteristic features that makes it popularly sought by landscapers, interiorscapers, gardeners and florists alike. Cigar Calathea is an exotic tropical stunner that easily forms an attractive clump of extremely large paddle-shaped leaves that are gracefully held on long stalks that emerge from its underground rhizomes. Like the beautiful Heliconia species of the tropics, their bluish-green to green blades with reflective silver undersides are appealing and exotic-looking . As exotic too are the erect, 30-cm long inflorescences that are produced year round, having a cigar-like structure and coloured reddish-brown, maroon or chocolaty, appearing rather unusual and unique in shape and shade. Besides, the tiny yellow flowers that peep from the uniquely coloured bracts present a fabulous contrast! Grow Pampano or Cigar Calathea for that dramatic display of exotic tropicals in your garden! Etymology: The genus name, Calathea comes from the Greek word, kalathos, meaning a basket, in reference to the inflorescences borne by some species. The species epithet lutea, derived from the Latin word luteus, meaning yellow or saffron, alluding to the colour of its tiny flowers. Origin: Native to tropical America – from Mexico, Mesoamerica, Caribbean and downwards to northern and western South America, including Brazil. Plant type: An ornamental herbaceous shrub. Features: Calathea lutea is one of the taller (or is it the tallest?) species of the genus Calathea that consists of about 100 species that are valued for their decorative foliage. It is a fast-growing herbaceous plant of medium height, reaching 6-10 feet (1.8-3 m) tall. An evergreen perennial that reproduces vegetatively by underground rhizomes and quickly forms an attractive and dense clump of long yellowish-green stems, bearing gigantic oblong-shaped leaves that tower over its impressive inflorescences. Each large green blade is about 1 m long and 40-50 cm wide, and beautifully ribbed with symmetrically curved venation. Its underside is glaucous, meaning, coated by a silvery-white, powdery wax that is highly reflective to ward off the heat. True to form of plants in the genus Calathea or Prayer Plants, the broad-leaved Calathea lutea will also play out its daily regime of complex leaf movements involving elevation and folding of its leaves by means of the pulvinus or geniculum. Its leaf surface will become vertical but not folded at dusk/night (known as nyctinasty – movement following the onset of darkness or changes in light and temperature), then somewhat horizontal in the morning, and back to vertical again and folded at noon (paraheliotropism – movement of leaves to avoid or to minimize exposure to sunlight), then horizontal again in the late afternoon and at dusk, the leaf movement cycle repeats itself. 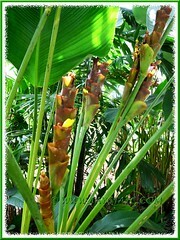 Cigar Calathea is free-flowering throughout the year under favourable conditions in the tropics. Its exotic one-foot (30-cm) tall inflorescence that emerges from the stems is unique and eye-catching. It consists of thick and waxy reddish-brown, chocolaty or maroon bracts that are stacked over each other to form an erect cigar-shaped or candelabra display. Simply stunning! An added interest is the true flowers that emerge between the bracts, though tiny and rather inconspicuous, the yellow flowers provide a marvelous contrast! 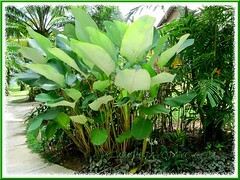 Culture (Care): Calathea lutea grows easily with minimum care. Light: Grows best in partial shade or filtered sunlight. Though it can tolerate full sun when well-established or acclimatized, best to provide some shade as direct sunlight may bleach or scorch the leaves. Moisture: Medium water requirements, preferably with regular watering. Soil: Prefers moist, organic-enriched and well-drained soil. Though tolerant of poor clayey soils, it must be free draining. Others: Fertilize regularly. It loves warmth and humidity and benefits from occasional showers on the foliage during hot and dry seasons. 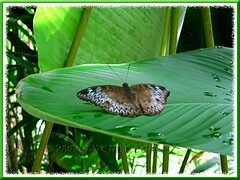 Brown edges on the leaves indicate that the air is too dry and require a higher humid environment. Quite a hardy plant with leaves that are somewhat resistant to tearing and known to handle harsh and windy conditions quite well, even near the seaside. Generally free from serious pests and diseases. However, watch out for caterpillars and beetles that may devour the foliage. For subtropical and temperate regions: Hardiness: USDA Zone 10-11. Grows well in tropical and subtropical climates. It blooms from spring to summer but almost year round in warmer regions. It is frost-tender and must be overwintered indoors with sufficient lighting and water sparingly during lower temperatures, allowing the soil surface to dry between each watering. Mist plants regularly to maintain high humidity and prevent browning of leaf margins. Indoor room temperature should be maintained above 60°F (15.6°C) and draft-free. Rhizomes can be lifted in cold winter climates and stored for next growing season. Propagation: By rhizomes with first flowering occurring within 12 months of planting a rhizome. Can be propagated by division of clumps too. Usage: A clump of Calathea lutea make impressive accent plants in the garden, landscape and around pools with its exotic leaves and candelabra flowers. A wonderful clustering plant for masking walls and fences or as informal hedge and screen for some privacy. It’s ideal as a large container or raised planter specimen for indoor decor or located at the porch, patio and decks for that dramatic tropical garden design. Its long-lasing and uniquely-shaped inflorescences make fantastic cut flowers in floral arrangement and is very popular with florists. In the Amazon and elsewhere, the broad leaves are used as food wrapper for cooking and grilling as well as to line large platters when entertaining. I just recently got some of these from my neighbor. I love the grayish tinge to the leaves. Good for you, Gillian! 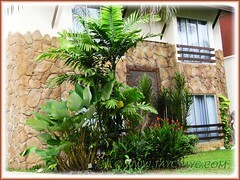 They’re fantastic tropicals for any garden design. a fantastic write up on this stunning plant. I have given it several attempts but haven’t succeeded. I had brought some rhizomes from Thailand in 2010, but failed. tried growing them from seeds in 2010 and failed again. I had brought three rhizomes this time from Thailand in 2011, they gave off shoots. however, the leaf edge as described above turn brown. I thought it must be humidity they lack. I live in a subtropical place (Bahrain), where the temperature goes from 10 to 45 deg.c during the year and humidity from 30 to 70-80. Its a one sided love, but I guess I’ll keep at it. that was a very quick response. 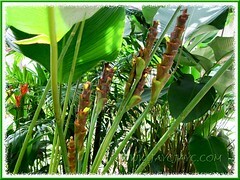 my success with or otherwise will not change my fascination and love for it or heliconias. I have visited KL twice. it is a lovely city and lovely people. you keep well. best regard to both of you. Thanks, Qaderrr! Take care and God bless. Calatheas of all sizes are among the best foliage plants. They have a reputation for being difficult, but I have found that extra care and attention to potting medium and plant position at the beginning will avoid most future difficulties. After that, the main challenge is correct watering – they are thirsty but never let the potting mix get too saturated. They are prone to leaf browning, but in Malaysia at least this is, in my experience, rarely due to lack of humidity. If the browning is away from the tip and is irregular, it’s likely overwatering (they hate wet feet and roots rot readily) if it’s tip or edges, then too much sun. They do not fertilizer burn immediately, but that can be a cause also over time. If happy, they are very prolific and vigorous growers – one my Calathea Crotalifera grew 8 inches in height in 30 days, and is now more than 8 feet tall. The “lutea” is that rare calathea that can tolerate full-on sunlight for part of the day. I would not try that with too young a specimen, but if at 3 feet plus they will make a great garden border and can adapt to sun. They will tower over your head in no time! Hi Liferia! Thank you for sharing your gardening tips and experience on the culture and care of calatheas. We really appreciate them. I am back with more Calathea tales! I have managed to grow a couple from seeds this time, one survived and is a foot tall and healthy. My anticipation is that if it makes it through our harsh and dry summer, then it probably will stay with me and multiply. Useful tips from Liferia post above, “thanks”. In fact I was drawn back here through Shades Of Grey site; another lovely one. and what I was doing there, was searching for the identity of a shrub that I have, but no success yet. I was wondering if sharing a photo of it could help? myself and my garden have both grown, of course me older, but my garden more complete. That only leaves one wishing to have started earlier! I still visit this site regularly and enjoy the posts and photos, and bring back memories of a place I love ,Malyasia. Thanks for updating us on the progress of your Calathea seedling, Qaderrr! All the best in nurturing the lone survivor to maturity. It’s wonderful to know that you’re a regular visitor to our site… we appreciate very much your support. hi Qaderr, did you succeed with the seedling in Bahrain? I live in Dubai and just brought 2 plants from Thailand, I would be very interested to see if they survived your summer! do you grow them in full shade and what soil mix you would recommend? Sorry Jacqueline to address to one of your commenters :) been to Malaysia many times, also in love with the place! Some special memories in Borneo, lovely people. thanks for the great intel on this lovely plant! Hi Mike… you’re most welcome. Great to know you’ve enjoyed touring our country. There’s no restriction whatsoever here… please do feel free to address your enquiries to anyone. We really hope Qaderr will respond accordingly. Does anyone knows where can I buy this plant? I live in CA. Thanks in advance.